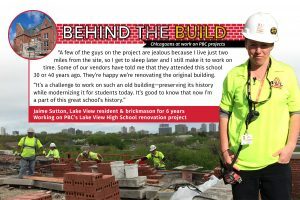 Jaime Sutton, Lake View resident and brickmason, worked on PBC’s Lake View High School renovation project. The Public Building Commission is uniquely structured to plan, design, construct, and manage facilities and infrastructure for the County of Cook, City of Chicago and its Sister Agencies. The process of adding new public facilities and infrastructure to a community is a complex one, involving General Contractors, Architects and Designers, Specialty Consultants, other subcontractors, public utilities and regulatory agencies, among others. Outreach and education are critical to these efforts. We take both seriously, and are constantly developing new means, including deploying the technological tools available to us, that draw people and businesses into our programs and projects. Those interested in working with the PBC are encouraged to explore our website and learn more about how the PBC shares information about upcoming projects. Please take time to register for PBC Alerts where you will be notified about upcoming PBC opportunities.